First impressions really do count, so ensure your reception area says what you want it to with our quality range of reception seating and tables. The Alto reception seating is a modular range of reception chairs that can be configured any way you want to suit your space. Featuring a solid wood construction, the deep seat and comfy back rests are filled with foam. The Alto reception seating range is available in a wide selection of colours in both fabric and vinyl upholstery. Call 020 7536 2310 to order fabric samples. Tanto's single tub and 2-seater sofa are designed with gently sloping arms and deep-cushioned seats for maximum comfort. Their two-tone design makes Tanto a stylish choice for any reception area. Tanto is available in a wide variety of fabric, vinyl and leather upholstery. A cost-effective and practical choice, the Encounter's collection of attractive tub chairs and sofas will enhance any reception area, waiting lounge or informal meeting room. Available in black leather-look and blue fabric upholstery. Moonstone reception seating is comes in single chairs or double-seat sofa. The seating has a robust metal frame with stylish chrome-effect side guards and is upholstered in durable bonded leather. The Forum collection is an affordable, flexible and fully modular seating solution. The range seating includes full-arm and non-arm segments and inner and outer corner sections so you can configure your reception area seating just the way you want. Intro is a simple, yet stylish modular seating system that offers endless configuration possibilities. You can choose to have Intro as a bench system or multiple-seating solutions with backrests. Giggle is a distinctive collection of seating that will complement many types of environments, from reception spaces to breakout areas. With every chair featuring a striking chrome frame and fully upholstered, the Giggle seating solution makes a strong visual statement with a touch of luxury..
With its unique 5-star swivel base, the Milano collection of chairs will certainly enhance any space. Its lightness and mobility make it a great choice for informal meeting rooms and reception areas, and also make it easy to reconfigure into clusters for group gatherings. Gomez is a striking single chair that can be used on its own or as part of group seating. A distinctive, robust and fully upholstered chair with chrome legs, Gomez is a great choice for all reception areas. Combining a generously proportioned seat with a compact footprint, our exclusive Solace range is a versatile seating solution, perfect for smaller spaces. The stylish tub design offers exceptional comfort, while the sleek, brushed-chrome legs bring this classic right up-to-date. Incorporating a modern, space-saving design, Dot and Dash are a compact and stylish answer for any contemporary reception, touchdown and breakout area. The Dot seating model has an unusual tubular design, while its partner, Dash, forms a compact square sitting on strikingly modern chrome legs. 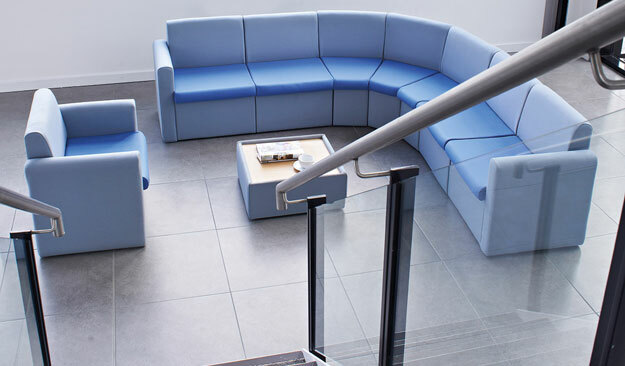 Fifteen is a modular seating system perfect for breakout and reception spaces. Comprising free-standing, sectional elements of varying heights, the units are designed with a 'Fifteen' degree convext or concave angle, instilling in the range a less rigid character. The Fifteen range affords comfortable seating with enhanced privacy for your public spaces. The Chicago modular range of seating takes the bold and distinct aesthetics of the larger Chicago sofa to create an entirely new collection of configurable seating. With Chicago, you can have multiple combinations and a wide selection of fabric choices and accessories. A dynamic seating solution that complements any space, from reception areas through to open-plan offices. Tandem helps you to define your reception area and other workspaces. The central cube acts as a junction, allowing you to configure your seating into a multiplicity of shapes and linked designs. Tandem has an undercut design and satin chrome finish.